NOTE: This identification guide is best viewed in landscape orientation on mobile devices. A variant called VISION WHITE, or "White Vision", was produced in France circa 1988. It was mainly sold in Europe, though there is some evidence it was retailed in Canada as well. It is rare, but occasionally turns up, on the second hand market in the USA. VISION WHITE is made out of an opaque version of Pyroceram commonly used for Pyroflam or Corning Ware. The temperature the vessel is exposed to during the ceramming process dictates the translucency of the final product. In this case, the VISION cookware is cerammed until the Pyroceram turns white as opposed to transparent amber. 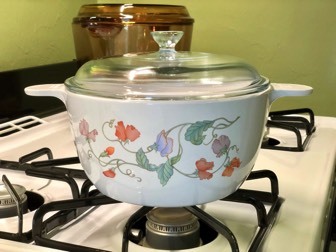 This line is similar to the VISIONS saucepans and skillets sold in the USA but is made using French VISION molds and features its own unique decorative patterns. NOTE: As this was a European release it was sold under the "VISION" name rather than the "VISIONS" trademark used in the USA at the time. Some plain VISION WHITE skillets were apparently sold under the "VISION DECO" line, as well. Select a thumbnail to enlarge the image. VISION WHITE was produced in at least three decorations. A plain white version was also available. VISION WHITE saucepans were available in sizes ranging from 0.7L up to a 2.5L work horse… The 1.5L saucepan is notable for featuring a pour spout that is missing from USA models of that size. These 0.7 Liter saucepans with lip are ideal for making sauces, gravies, melting butter, and cooking smaller portions. Perfect for serving on top of a warmer at the table. Circa 1988, this 0.7 Liter saucepan with lip is ideal for making sauces, melting butter, and cooking smaller portions. This was sold without an available lid (Though the glass cover from a small "Grab It" bowl will fit). These 1 liter saucepans are perfect for heating ready-to-serve soup or vegetables, up to 2 or 3 servings. "1.0L White Saucepan + Knob Cover Lid"
Circa 1988, this 1.0L saucepan came with a 16cm clear glass cover. "1.5L White Saucepan + Knob Cover Lid"
Circa 1988, this 1.5L saucepan came with a 18cm clear glass cover. Typical of European models, but unlike those sold in the USA, this saucepan features a pour spout. These 2.5 liter saucepans are ready for serious duty in the kitchen. Cook potatoes, carrots, other vegetables for up to 6 servings. "2.5L White Saucepan + Knob Cover Lid"
Circa 1988, this 2.5L saucepan came with a 20cm clear glass cover. Though only one size of cook pot was available in the VISION WHITE line, the 2.5 L is equally at home as casserole or sauce pot. "2.5L Casserole + Knob Cover Lid"
This cook pot features the same easy-to-grip, rounded handles as seen on French-made VISION casseroles… It came with a 20cm clear glass cover. The VISION WHITE line offered 9"/24cm and 10"/26cm skillets. These skillets feature a unique "waffle" texture on the interior bottom. The lower areas of the design act as reservoirs to hold oil/butter more evenly across the width of the vessel resulting in more uniform cooking. These 9 inch/24cm skillets are the perfect for morning bacon and eggs, pork chops, hamburgers, and browning other meats. Circa 1988, this 24cm skillet was sold without a cover. These roomy 10"/26cm skillets will handle large omelets, steaks, and other family sized meals. "26cm White Frypan + Knob Cover Lid"
Circa 1988, this 26cm skillet was originally sold with a 26cm clear glass cover. These 9 inch sauté pans are the ultimate Visions vessel for browning chicken and slowly cooking other meats, fish, and vegetables to perfection. Great for saucy or water-based cooking. The ideal depth to hold lots of chicken plus the required oil to fry to a crisp brown. Large, family-size, capacity is also great for browning roasts and stove-top braising. "24cm "Chicken Fryer" Sauté Pan"
This sauté pan is a bit of a mystery. Unlike other VISION WHITE pieces that date to the late 1980's, there are several details which indicate this was produced much later. The location and marking, in addition to the pebbled texture on the exterior base of the pan, seemingly date this to the mid-1990's. The place of manufacture is notably missing, as well. It is currently unknown whether this was sold with a glass cover.